A fluffy, sweet, super simple German apple cake - perfect for fresh picked apples! Mix the first six ingredients in a large bowl. Press dough into a well greased (or lined with parchment paper) 13 X 9 X 2 jelly roll pan. Mix the apples with about 1 teaspoon of lemon juice. Add 2 tablespoons of brown sugar and ½ teaspoon of cinnamon. Lay the apples in rows on top of the dough. Press the apples into the dough. 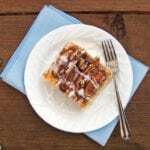 In a small bowl combine ¾ cup brown sugar, 1/2 teaspoon cinnamon, ½ cup granulated sugar and chopped nuts for the topping. Set topping aside. Bake in preheated 350 degree oven until cakes starts to expand, about 15 minutes. Sprinkle topping evenly on the cake. Return cake to the oven and bake until lightly golden brown, about 15-20 minutes. Cool cake in pan on a cooling rack. When completely cool drizzle cake with a sugar glaze. This can be made from confectioners sugar and milk or slightly melted frosting.